The literary sub-genre of “re-worked classics” seems to offer a good deal of potential discussion fodder. Are these works a more highbrow variant of fan-fiction? Do they have a built-in audience thanks to their basis in known source material, and is that a good thing or a bad thing? My short answers to those questions would be “depends,” “probably,” and again “depends,” but longer, more thoughtful ones are certainly warranted. 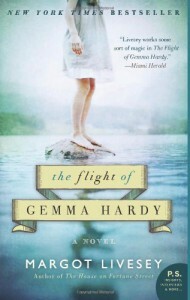 Margot Livesey’s The Flight of Gemma Hardy reworks a particularly enduring classic, Charlotte Brontë’s Jane Eyre. I’ve read the original just once, during my university-era phase of filling gaps in my literary experience. My response to it was largely indifferent (although I greatly preferred it to her sister Emily’s sole novel, Wuthering Heights) and my recollections of it are vague on details (although they were sufficient to get me through Jasper Fforde’s The Eyre Affair). For the most part, I like Jane as a character, but I really don’t find Rochester or her relationship with him appealing; for me, ...Gemma Hardy’s inspiration wasn’t a compelling reason to read the novel. But as I learned more about the book’s merits apart from its source material, I grew more interested, and I’ve been meaning to read Margot Livesey for a while. ...Gemma Hardy follows the basic framework of Jane Eyre: A bright young orphan is exiled to a terrible boarding school where she is treated more as laborer than student. When the school closes and she is forced to leave, she has few options and fewer resources, and takes a job as a live-in nanny/teacher at a remote estate, where she becomes intrigued by its mysterious master. However, Livesey has relocated the story’s place and time to Scotland in the mid-twentieth century, and for me, the more modern setting was an asset to both plot and character development. She also uses Brontë’s model of first-person narration, but gives Gemma a distinctive voice and a unique history; our Scottish orphan was born in Iceland, and is deeply curious to know more about her native land and whether she has family remaining there. Perhaps it’s because I did only read it once and my memory is faulty, but I think of Jane Eyre as primarily a romance...and one that I don’t find particularly romantic or convincing. ...Gemma Hardy’s involvement with her employer/fiancé Mr. (Hugh) Sinclair is the Jane/Rochester plot, and while I found it somewhat more appealing here--mainly because I think Sinclair is a better-drawn character than Rochester--I still didn’t find it terribly romantic or convincing. I preferred the novel before and after that, and was drawn to Gemma on her own, with her resourcefulness, intelligence, and drive. I didn’t entirely buy the events of the last several chapters of the novel, but considering how Gemma came to them, they felt right. I’d like to revisit that fan-fiction question another time, but I do think that fiction based on other fiction does have certain potential advantages in attracting an audience. On the other hand, those same qualities can have the opposite effect, either turning fans of the original against the retelling or discouraging interest from non-fans. I fell into the second camp for a while with The Flight of Gemma Hardy and its Jane Eyre connection, but I’m glad I got over myself--for me, this was a more satisfying read than its inspiration.